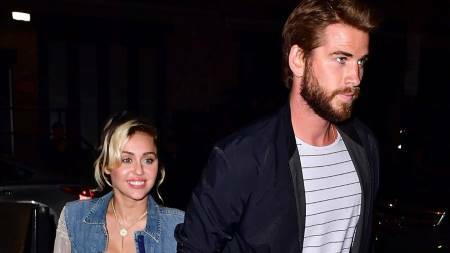 Hollywood couple Miley Cyrus and Liam Hemsworth celebrated their Honeymoon in the snowy mountain after their secret wedding. Upon the completion of their secret wedding, the newlywed couple, singer Miley Cyrus and actor Liam Hemsworth spent their romantic Honeymoon in the magical mountain of (Hannah) Montana. Miley Cyrus walked down the aisle in December last year with the love of her life, Liam Hemsworth. And in less than ten days, the couple who only confirmed their status as husband and wife after keeping their wedding a secret for a while headed to Montana for Honeymoon. As a matter of fact, the pair is in Montana with the whole Hemsworth family. The 26 years old singer who wore an all-black outfit from top to bottom with a matching black hat and silver color beret posted a picture of herself on her Instagram. "eyes match my lips, bag match my fit"
Besides this, Cyrus continuously posted other pictures as well that displayed the singer celebrating New Year with a champagne bottle in her hand. The next picture included Miley 'just being Miley', as she posed throwing a middle finger sign. Miley's brother in law, Chris Hemsworth posted pictures of their holiday in Montana as well. Chris famous for playing the role of Marvel's Superhero Thor shared a picture with Elsa Pataky enjoying the new year, in the same room where Miley is seen in her recent Montana Instagram post. Likewise, sister in law Elsa posted a snowy picture of the couple on her Instagram as well. However, the singer is still yet to post her Honeymoon pictures with husband Liam. Maybe we can get our eyes on it soon?